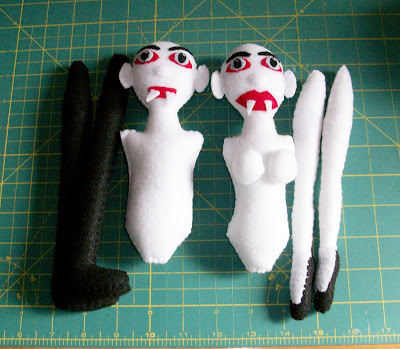 I'm going full force on making dolls right now. Working on a Halloween set and have made good progress on 4 of the 8 I intend to complete. Here's a sneak peek. I went to the craft store yesterday specifically to pick up buttons to do the joints of the dolls and didn't even buy them. I'm a doofus. So I need to go back again cause 2 of the dolls are dressed and ready for limbs. I'll probably hold off on showing them until I finish the whole set but maybe not cause I get so excited and want to share what I'm doing, so we'll see. 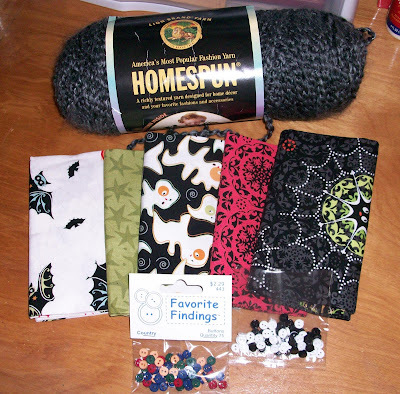 I did pick up some great Halloween type fabric and some small detail buttons that I did need too. Also this great yarn that I have special plans for. These dolls are looking EXTRA fun! I'm especially loving those vampires! They are looking great! OMG..LOVE your dolls..these are so stinkin CUTE! !